Allin is an all-around player with impressive talent and strong leadership. He posted impressive numbers in his fourth year with the men’s basketball team, capturing the CIS scoring title with 23.2 points per game, finishing third in the nation for total points with 441 and eighth with 9.4 rebounds per game. In January, he posted the modern-day Laurier record for most points in a game with 43, just days after his father passed away. Cerilli started on the men’s hockey team this year and excelled immediately. The rookie posted 11 goals and nine assists in 27 games, placing him third for both goals scored and points on the team. Cerilli consistently was an asset to Laurier, especially in the second half of the season in their 9-3 run going into the playoffs. In three playoff games, Cerilli recorded two goals and two assists in three games, including the tying goal in a come-from-behind win in game one over the Guelph Gryphons. 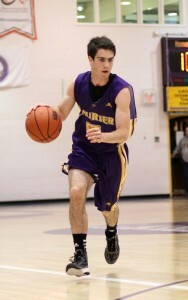 In 2011-12, Coulthard was named rookie of the year for the men’s basketball team and posted 7.1 points per game. This year, he exploded on the court, finishing tenth in the country with 19.4 points per game and ninth in the country for total points with 408. 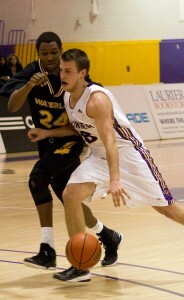 Coulthard finished second for WLU for both scoring and assists behind Allin, while finishing first in steals with 34. After facing countless injuries throughout her career, Hillis came back for her fifth and final season to provide a young women’s basketball team with veteran leadership. 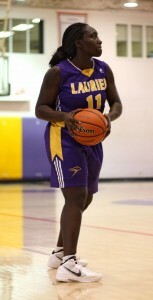 She recorded 166 points, more than any of her previous years with Laurier, 60 rebounds and averaged 7.9 points per game. In her final home game, Hillis scored the winning basket in the final 12 seconds of the game. She consistently persevered through injuries and was awarded the CIS Tracy MacLeod for her determination. Not necessarily a quiet character, Bonsu consistently helped her team in every area. An avid rebounder, she helped when the defence was down and big plays were needed. When she suffered a concussion, her team felt her absence, but she was consistently with her team, filled with enthusiasm. A charismatic athlete, Bonsu was a finalist for the Outstanding Women of Laurier award and will continue to be a motivation to her team in her final year. The women’s soccer team allowed just five goals in five playoff games in the 2012 campaign. In all five affairs, it was credit to the defence and stellar playing of goalkeeper Ward, who consistently made big stops and plays to keep the Hawks in the game. In the semifinal against Queen’s, Ward was challenged throughout and made a big stop on the third shooter of the shootout to lead Laurier to the win. 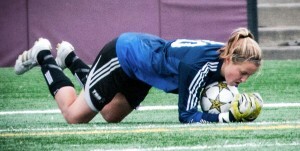 At nationals, she let only three goals against and kept Laurier in a close game against the Trinity Western Spartans, which they lost by one point. They knew the OUA was more competitive, but no one saw it coming when the women’s hockey team was ousted in the semifinals. 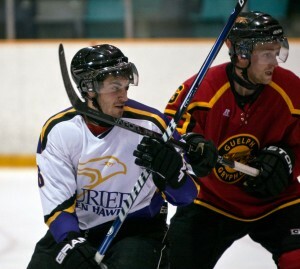 The Hawks defeated the Waterloo Warriors handedly in the first round, but struggled against the Western Mustangs in the second round, losing the series opener and suffering a bad bounce late in the third. For the first time in ten years, Laurier would not be at the CIS championships. Men’s football recorded a mere 3-5 record and fell in the quarterfinal to the Queen’s Gaels. After one of the worst seasons in a decade, featuring three games without a point and an entire month without a touchdown, there were speculations surrounding Jeffries leaving, but no one saw it when he resigned not even a week later. 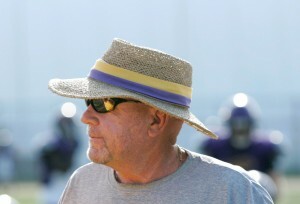 Jeffries had been part of the school for nearly 40 years and coached both basketball and football. It’s hard not to recognize the women’s soccer team, which was the only team, aside from swimming, that qualified for a national championship. The team was supposed to be in a rebuilding year, but finished atop the OUA West again with only two losses and three ties. Laurier made it to the Final Four and in the semifinal defeated the Queen’s Gaels in a shootout. In a close game against the no. 1 Ottawa Gee-Gees, Laurier fell just short of a banner. Despite their early exit, the women’s hockey team still excelled on a general level. The team had a significant group of experienced players and again clinched the top spot in the OUA. Three members were named to OUA all-star teams. Consistently, the team’s charisma and talent was captivating, and their focus and perseverance in game two of the semifinal series was a reflection of their abilities. Puhalski took a men’s hockey team that struggled in the beginning, winning only five games before the holiday break, and managed to turn them into a competitive, well-rounded team that went 9-3 in the second half of the season and finished fifth in the OUA West. Puhalski led his team into the playoffs where the Hawks came from behind to win game one in OT, only to lose the series by very close margins. He was named OUA West coach of the year.